This article was originally published in the Davis Enterprise in March, 2018. At the Pence Gallery this March, we are hosting three new solo artists, each who plays with color in a distinctly different way. 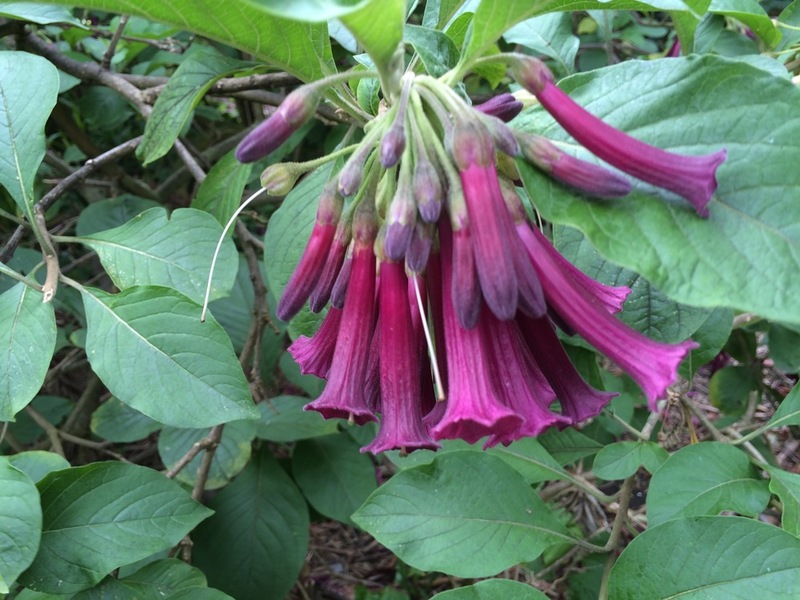 As we start to plan for our Garden Tour on May 6, color is a fitting subject to center on for the beginning of spring. Joe Kabriel’s exhibit, “Sense of Time and Place,” is on display from March 2 to 25 in our Andresen Gallery. Kabriel’s landscapes, such as “California Dreaming in Yellow and Gold,” are first drafted in pencil on one of his travels through the Santa Monica Mountains, where he lives and works. Like many Davis residents, he travels largely on a bike, and his scenic views merge a panoramic perspective with heightened color and texture. Some of his drawings are printed on aluminum plates, which gives them an iridescent sheen — an appearance that he heightens through digital manipulation of color and pattern into a truly unique landscape. As he writes, he hopes through his views to “rediscover the wonder of nature seen through a child’s eyes … and to ponder the meaning of life with fresh hope.” Like many landscape artists, Kabriel reflects on how capturing nature can be both a space to “explore the personal conversation between the inner and outer landscapes of the world around us.” Kabriel will be present for the public reception from 6 to 9 p.m. Friday, March 9, at the Pence, so please feel free to stop by to see his amazing view of nature. 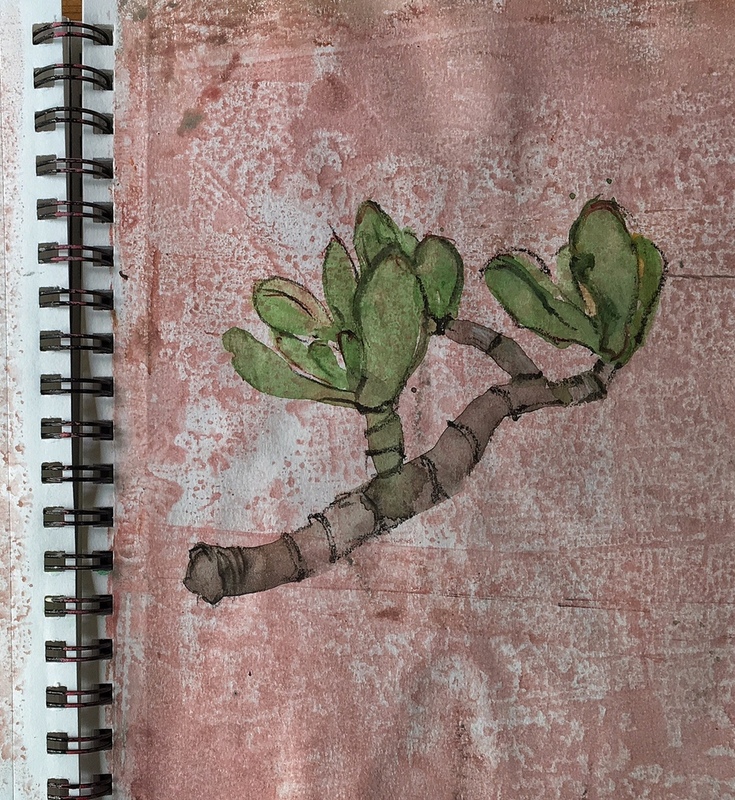 Hunter still loves to collect leaves, which she brings into the studio, to capture the shape, texture and linear qualities of various leaves onto paper. 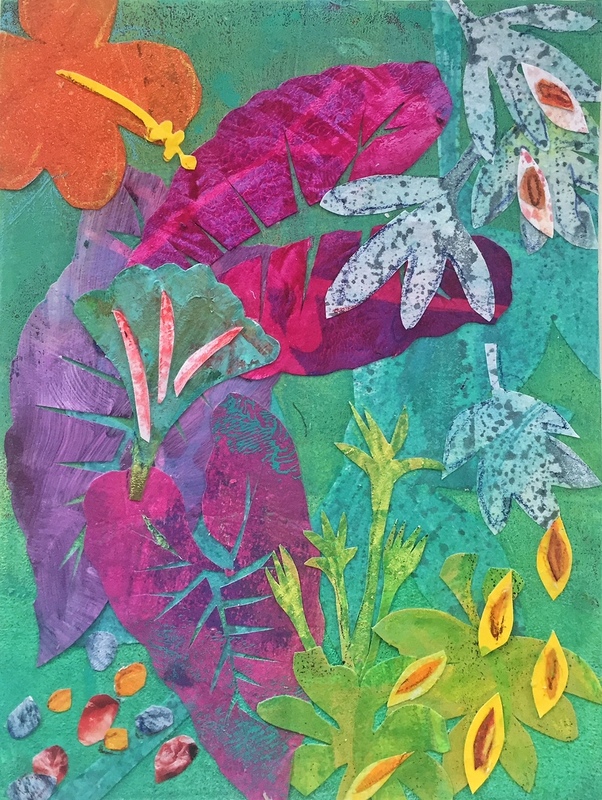 She uses a monoprint process to do this, rolling out a layer of acrylic paint on top of a gelatin-based plate, and then placing leaves on top. After the paper is placed on top, a brayer is used to press the paint onto it. Some prints are layers of four to five individual print runs, and successful prints are assembled with other versions into an overall larger composition. 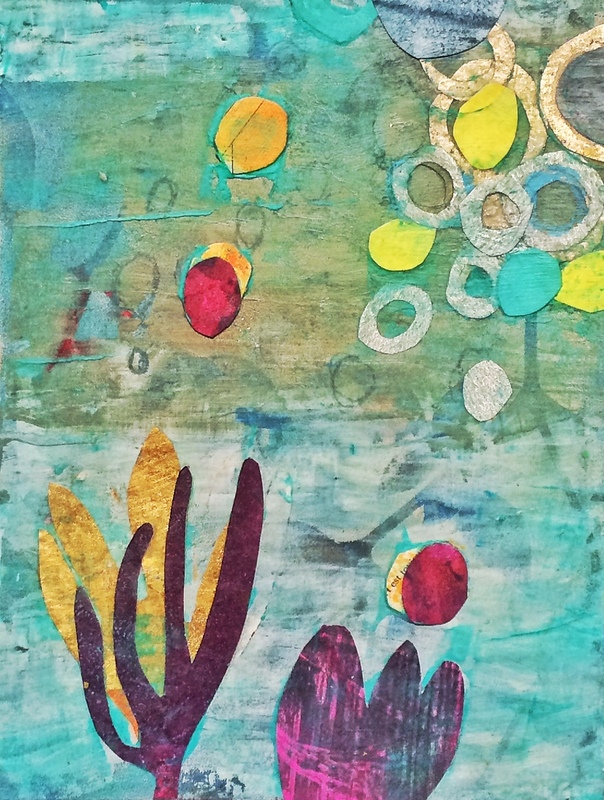 Sometimes the artist uses natural dyes and pigments to create her prints, which gives her work a natural feel. 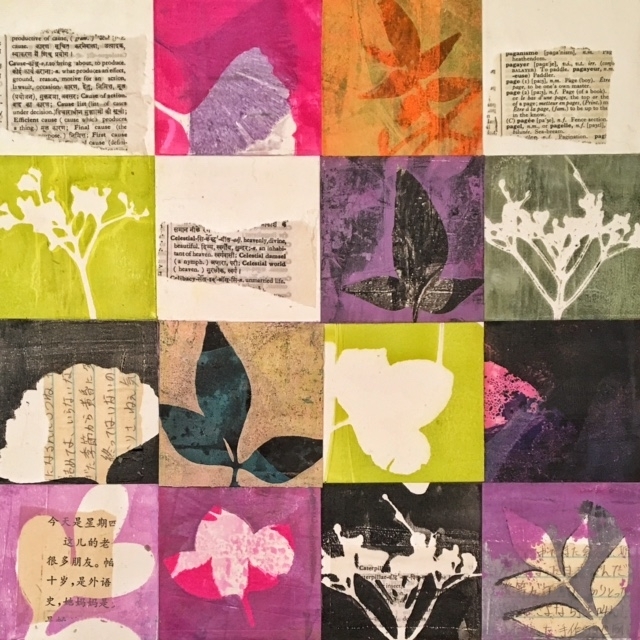 To learn her process, plan to attend her Botanical Print & Collage workshop, on Saturday, April 7, from 10 a.m. to 6 p.m. Sign up now at brownpapertickets.com. The cost is $105 ($115 non-members) and includes all supplies. Attendees will also create a small accordion-style book with their prints. 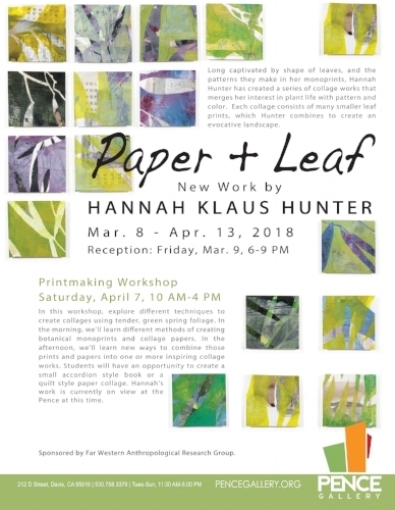 Hunter’s exhibit, titled “Paper + Leaf,” is on display through April 13, with an opening on Friday, March 9, from 6 to 9 p.m., sponsored by Far Western Anthropological Research Group. 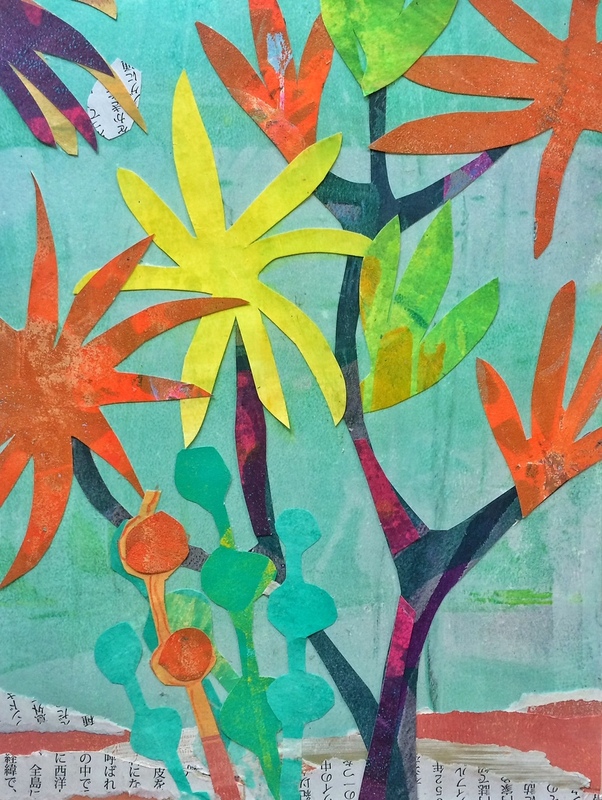 Another related workshop this month is our Ecoprinting session, from 10 a.m. to 4 p.m. Saturday, March 17. 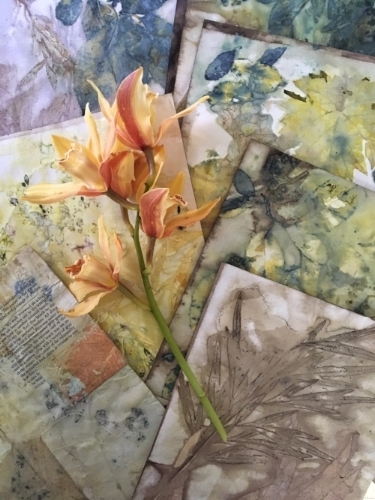 Book artist Dorothy Yuki has taught this workshop on using natural dyes and metals to make prints on cloth and other materials for many Bay Area arts organizations, and after Hunter participated in it, we heard so many great compliments that we had to bring it to Davis. The cost is $165 ($175 nonmembers), and artists can register online through www.brownpapertickets.com. Last but not least, San Francisco artist Nicole Mueller unveils a new installation as part of her “Light Matter” exhibit, on view through April 13. Mueller’s works are both exuberant and complex, with shifting figure-ground relationships, vibrant color and pockets of deep space, creating pathways that weave in and out of her compositions. Her large works are painted, cut, collaged, arranged and rearranged, resulting in works that exist between chaos and cohesion. Mueller is the winner of the Glickman McClure Artist Award for 2018. Given to an emerging artist who produces a new body of work for the Pence, the award is donated by Mark M. Glickman and Lanette M. McClure, and includes a generous stipend. Mueller is primarily a painter and mixed-media artist, but she is stretching into three-dimensions with an installation of suspended colored Plexiglas shapes. This one piece will be installed in the Bill and Nancy Roe glass tower, visible from our D Street entrance. Not daunted by heights, the artist will be installing at the top of a 20-foot scissor lift soon, securing clusters of wires with the colorful forms on them, so that when light passes through, the hues merge and overlap in truly magical ways. Mueller’s inspiration was a French chapel with stained glass designed by Henri Matisse, and her installation is sure to have a very spiritual presence. As with any piece that is dependent upon natural light, it will constantly be changing, due to the shifting light conditions. Her Artist Talk, which describes much of her artistic process and the fabrication of this recent installation, is from 1 to 3 p.m. Saturday, March 24. While the event is free, we are asking visitors to RSVP online, at www.brownpapertickets.com (search Pence Gallery). Mueller will also be present during our public reception on Friday, March 9, from 6 to 9 p.m., so stop by for a glass of wine and to meet the artist. — Natalie Nelson is executive director and curator of the Pence Gallery; her column is published monthly. I was recently asked to write a guest blog post for Ann E. Grasso, a talented East Coast artist and architect. I had a great time reflecting and writing it and wanted to share this repost with all of you. Because I take classes online, I meet people from various geographical locations that I would never bump into otherwise. Hannah fits this category. While my usual draw is the visual, in the case of Hannah, it was her words, her thoughts, her care, and concern. 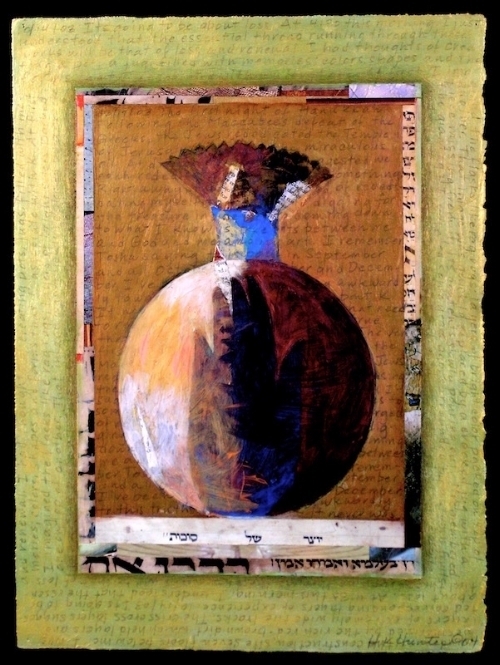 Therefore, it is interesting to learn from her writing below that her first solo show was titled Text and Image. Text came first. It is my sincere pleasure to know Hannah through her art as well as her words. Text and Image was the title of my first solo show, many years ago. The title conjures a feeling of magic; the alchemy that occurs when words are combined with images. Those 3 words continue to resonate in my art, years later. How did I come to add text to image? It’s classic case of nature and nurture. I went to college in Iowa City, IA, home of the Iowa Writer’s Workshop. Words flew through the air like birds. And my parents were writers; it was natural that text would flow into my work. A bookworm from childhood, I just figured that the best way to approach a piece of paper was as a page of a book. Nonetheless, it took many years to figure out how text and image (painted, drawn or printed) interact and how I can use them in my art to create a tight and powerful piece of work. When I incorporate text, I’m aware that the words exist as hundreds of drawn lines which combine with the lines of paint or drawing to form a composition. I love to use foreign language books and because I can’t read Japanese or Hebrew (for example) and I lean more on the linear quality of the letter forms. I also use my intuition when placing text. There are times when someone sees my work at an exhibit and knows the language that I have used. More often than not, the meaning of the words harmonizes with the spirit of the artwork. Another issue that arises when incorporating words is whether or not the words need be readable (especially in English). I’ve gone back and forth on this. There are times in my work when I obscure the words, turn them upside down and make them difficult to discern. I don’t want them to lead the meaning. In my most recent work though, I’m more open to the words being easy to see and read. I’m using a Hindi-English dictionary as well as another dictionary in French. I can understand some of the French, and that adds additional shades of meaning to the piece. And although I can give you reasons why I include words in my work and tell you how I use them, what undergirds it all is a kind of joy. When words come together with color, shape and form, I feel whole and complete. How about you? How do you use text in your artwork? I’d love to hear from you. You can find me at https:hannahklaushunterarts.com, hkhunterarts@gmail.com or on Instagram: @hkhunterarts. Recently I’ve thought about the line between inspiration and influence and when influence can become confluence in art. I wanted to break it down even further so I could understand how these elements operate in my own art making practice. Last week, I had the chance to explore the thread I call “confluence” following a workshop in botanical contact eco printing. I love the ethereal effects that I see in eco printing and wanted to see if I could use plant pigments in my own monoprints. The workshop, led by artist Lotta Helleberg, was challenging and absorbing. 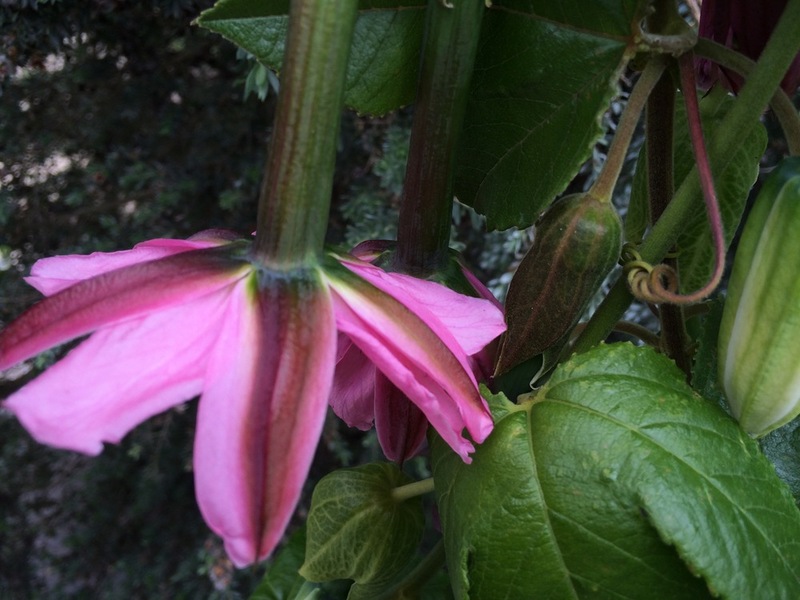 Each day we explored the subtle combinations that plants and mordants (fixatives) can create. I tried to keep the various equations in neat columns in my mind’s eye. My best work came when I threw up my hands and stuck to the basics. The question of inspiration, influence and confluence only truly emerged back in my studio. 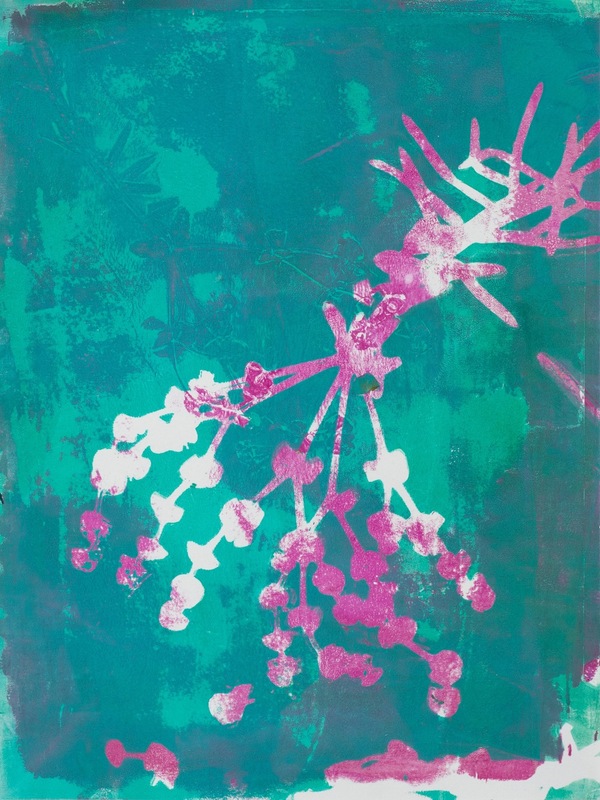 I work with plant materials, acrylic paints and a gel plate to create botanical monoprints. I wanted to carry over the watery influence of the eco dye baths; the way plants emboss themselves into the paper and leave tangible marks of their presence. I figured this would be easy. After several printing sessions, I ended up with prints that were neither eco nor mono but a muddle. “What’s going on?” I wondered. “I know how to do this.” I was confused until I received an email from another student. She mentioned how stuck she was following the workshop. The metaphor of two rivers joining rushed into my mind. When one river joins together with another, it’s called a confluence. Many things happen when two or three volumes of water with different temperatures, speed and density merge. It’s a messy affair. The same thing happens when we take part in classes or workshops. The nature of a workshop is immersion; in technique, artwork and the work of other artists. That’s confluence. Once back home, it’s confusing. What’s us? What’s not ours? What marks, patterns or colors looked good but may or may not belong in our work? Like two rivers converging, it takes time for new material to settle, to allow our unique voice to emerge, hopefully all the stronger for joining with others. After all, when the Yangtze River absorbs the water from the Jialing, it becomes more powerful and runs for thousands of miles until it meets the South China Sea. How about you? What’s your experience of confluence in your work? We just concluded our yearly retreat at Wellness Within. Located just outside the Tahoe National Forest at 3500 feet, Harmony Lodge was a cozy place indeed as the rain poured down outside. Our focus was self compassion; we spent the afternoon trading stories, thoughts and memories as participants created papier-mâché "bowls of compassion." Tears and laughter filled the room as one woman after another shared her thoughts and colorful bowl. The bowl of compassion project is just one of the art therapy workshops that I'm offering this year at Wellness Within, a cancer support organization in Roseville, CA. Early in the year I wanted a focus around which I could build this series of workshops. Grazing the internet, I came across Brené Brown's 10 guideposts for wholehearted living. On my first read through her book, "Gifts of Imperfection," they did not leap off the page. This time was different. Fascinated by the way the guideposts* actually offer a set of prompts to cultivate these qualities, I knew that I'd found my subject. The Wellness Within folk are a diverse group, tied together by the commonality of a cancer diagnosis. They often arrive newly diagnosed, shocked and alone--or further along the treatment spectrum, seasoned and ready to share what they've learned with others. I wanted the art projects and guideposts to offer each of them nourishment and a step along a path of healing. In January, we dove into authenticity and February was the month of self-compassion. (What better way to celebrate the month of love?) Each time we meet, I'm humbled by these women's courage and fortitude, and, simultaneously buoyed up by the stories they share. 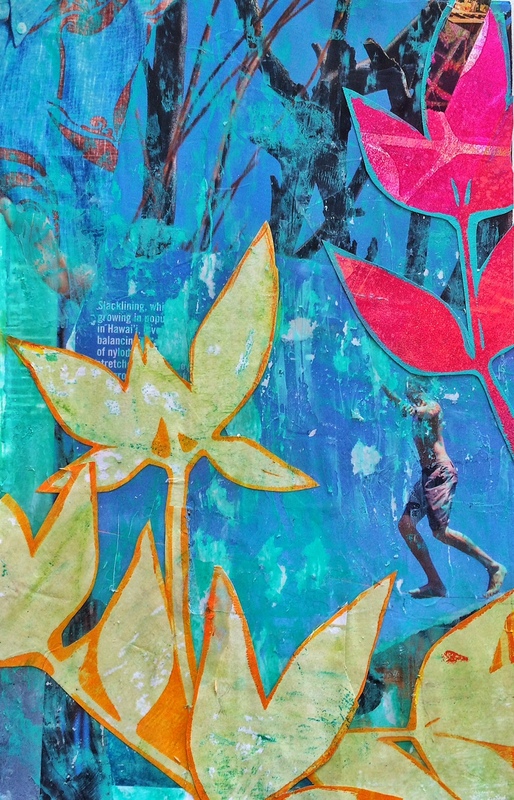 Going forward, we'll paint, print, collage and laugh our way through whatever arises on this sturdy path of months. And, as the year unfolds, we'll create practices that incorporate these guideposts in easy and practical ways. Our next workshop at Wellness Within is on Saturday, March 11 from 10 am - 12 pm. Our focus: cultivating a resilient spirit, or: let go of powerlessness, a topic that could not be more apropos for these times. If you'd like to join us, there are still several spots open. To register, or for more information, contact Wellness Within. Since the beginning of the year, I've made an effort to begin writing in journal form again and it's showing up in my art work. Small bits of text find their way onto paper, and I'm working on pieces that are deliberately sequential. I'm thinking about seasons, passages of time, and the way in which the seasons provoke us to change our direction. This is not new, I've been intrigued by the seasons for many years and have woven that into my work, whether in drawings, paintings, or prints. The difference is that I've begun to track more incremental changes, moment to moment and day to day. I've begun to work in smaller squares and rectangles, each piece representing a fragment in time, a feeling of the sun's placement in the sky. I had spent just a couple weeks on several panel pieces when I received an email from artist and gallery owner, Sara Post. Early last year, Sara opened up Art 26, a gallery and studio whose space is light, intimate and filled with inspiration. When I saw it, I thought "I'd like to exhibit here." That thought was reinforced by a series of excellent exhibits. The email said that Sara had a cancellation in the gallery for February, would I like to step in? Would I? It was a great opportunity, not to be missed and, a way to take the temperature of my new series. If you're in the area, join me at the reception, or or drop by the gallery this next month and take a look. I'll be giving an artist talk on Friday, February 10th at 6:00 pm. Come and celebrate the month of love! There are so many ways that we can slide on that delicate bridge of seconds from one year into the next. Like a newborn child, we can burst out suddenly, or, perhaps, be dragged by our head or legs, reluctantly surrendering the comfort of a warm, familiar home. One of the rituals I enjoy the most is looking back over the year. I began the year with a challenge to myself: to make 30 collages in a period of 30 days. I started in San Francisco, transitioned to Kauai, and completed the 30 days in my studio in Davis, Ca. Not one to rest easily with only one challenge, I posed another to myself; this one physical, emotional and spiritual: yoga teacher training. I was the second oldest in the class, but determined that my age would not exclude or daunt me. I loved it and I hated it; it tested my intellect, my body and perhaps most of all my patience. To stand, sit and move in one space for the period of 6 hours at a time, drew on my inner resources. I made it through. Artistic challenges also filled the year including one with the improbable title: "99 Problems, But a Print Ain't One of Them." The exhibit required a series of 13" x 19" prints. I hadn't printed on that scale before, instead, composing larger pieces by putting together smaller ones. As a result, I spent a lot of time at Blick Arts in their paper section! Thank god that Panera Bread was right next door for refreshments! Inspiration also found me in the teaching realm. I had wonderful students; eager, excited and indefatigable. I was amazed by their ability to create vibrant monoprints that radiated the stamp of their makers. I can't get enough of learning. From the Master Class with Lisa Call to my classes with Sara Post on abstraction, I found that each contact with either group or teacher gave me a tiny burst of inspiration and enthusiasm; a nudge, a push, or invisible fuel that allowed me to take the next step or steps in my work. They help me to catch hold of slender threads within that often elude me due to voices of inner bosses, outer cultural snobs and transient winds of change. With support, I can reach beyond them and catch those threads that have been dangling, just waiting for me to grasp hold of them. And that's what I want for this year, to pay more attention to the threads that dangle, sometimes just beyond my reach. because when I can catch them, and pull gently, I'm taken on roads that I cannot imagine. Can you imagine flying to a Hawaiian island, then driving up to a small house on stilts and setting up a studio for 2 weeks? That's exactly what I did earlier this month. 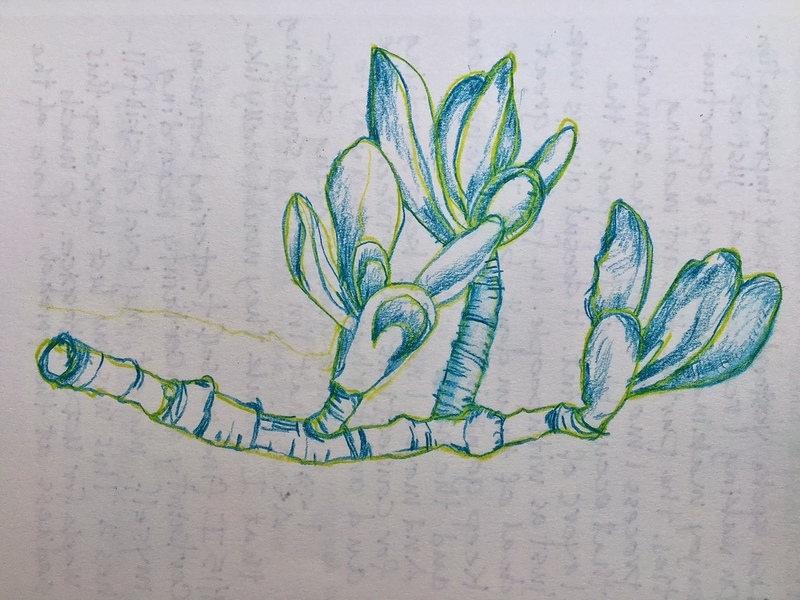 I was standing in front of my art cart about a year ago at the UC Davis Children's Hospital, looking over my supplies, organizing them for the day, when a nurse came through the door and began riffling through the coloring books on an adjoining cart. "Do you have anything for a three year old?," she asked. "That's a good question," I thought as I too flipped through the stack of donated coloring books. I saw Spider Man and his assorted cohorts, but nothing that would really be appropriate to a 3 year old's developmental needs. As I walked back to my office, I thought that we could really use a book with healthy images that connects children to the natural world without the inclusion of violence. When I got back to my office a bit later, I logged on to my email and found a new note from a person that I didn't know, Pauline Molinari, a book editor, asking me if I would be interested in writing the text for a coloring book. Kismet? Ask and ye shall receive? I was delighted that my unspoken question was answered so promptly. I quickly researched Pauline and the publisher for whom she worked, Walter Foster Jr.(an imprint of Quarto books), and picked up the phone. Over the next several months, we mapped out spreads, I created prompts and Stephanie's illustrations unfolded in response. All the while, I began to see more and more coloring pages emerge on artists' and art therapist's sites. I was excited and after the last prompt was done, the last quotation cited, the last drawing approved, I couldn't wait to hold the book in my hands. But I did-- until last Friday, when I arrived home from an opening to find a package with the publisher's return address on the label. There, packed neatly, was the quotient of copies promised to me; crisp and ready for crayon wielding fingers. I'm very pleased with the results and can't wait to share the book with my family and friends. If you'd like your own free copy of Be Happy and Color, leave me a comment at the end of the post. I'll put all the names in my husband's Irish cap and draw one. (And I promise to draw blind.) That fortunate person will receive a package full of inspiration and coloring bliss.